Prior to the advent of high frequency solid state devices like Gunn diodes, working at or above a couple GHz - even at low power - required the use of cavity oscillators such as klystrons and magnetrons. They were bulky, espensize and electrically very inefficient. This article outlines the theory of bulk oscillators as developed by Dr. John A. Copeland, of Bell Labs, and points out the peculiarities of the LSA (limited space-charge accumulation) mode that makes it possible to obtain 20 milliwatts of power at 88 GHz. Use of gallium arsenide (GaAs) enabled designers to construct receiver circuits into the mm-wave region without the need for klystrons, thereby reducing cost, size, and power requirements. With a bulk semiconductor operating in the limited space-charge accumulation mode, it is possible to produce 20 mW output at 88 GHz. 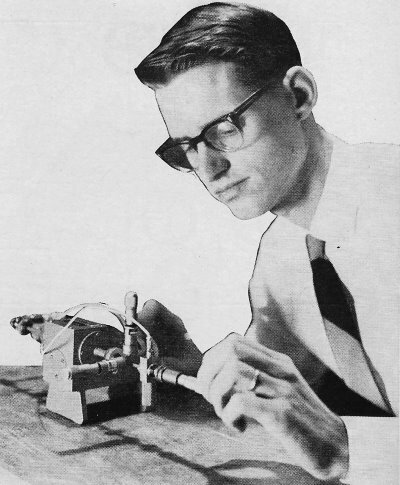 Dr. John A. Copeland adjusts an experimental solid-state millimeter oscillator which replaces cumbersome klystron. It has taken nearly twenty years of research, but the communications engineer's dream of a practical solid-state microwave energy source is about to come true. Development in r.f. transistor and tunnel-diode circuitry were painfully slow and until 1963 when J. B. Gunn announced the discovery of his 1-GHz bulk semiconductor oscillator, a sweeping revolution in solid-state microwave electronics always seemed to lie somewhere just beyond reach. Although Gunn's device stimulated a great deal of research activity with bulk semiconductors, it has not provided the final answer to the solid-state microwave problem. 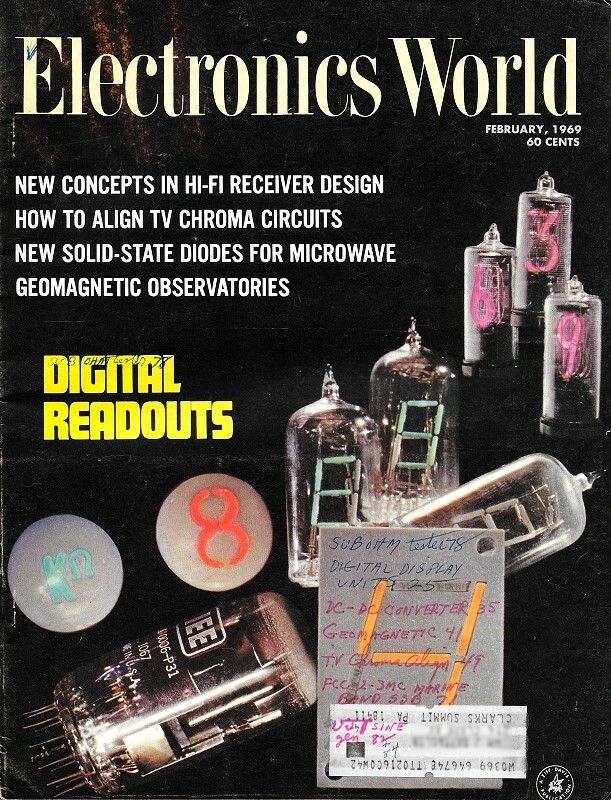 (See "Gunn Oscillators", Electronics World, September, 1967.) One major difficulty with the Gunn device is that its operating frequency is determined primarily by the time it takes a space-charge to travel from the cathode to the anode. Unfortunately, shortening the active region in order to increase operating frequency also reduces the area available for dissipating heat generated by the moving space-charge. Early in 1967, Dr. John A. Copeland of Bell Telephone Labs showed that it is possible to "quench" the Gunn space-charge and let an external LC circuit rather than the transit time of a space-charge determine the operating frequency. The implications were that the active region of the bulk semiconductor may be made much longer to facilitate heat dissipation without severely limiting the operating frequency. This article outlines the theory of bulk oscillators in general, and points out the peculiarities of the LSA (limited space-charge accumulation) mode that makes it possible to obtain 20 milliwatts of power at 88 GHz. Both Gunn and LSA diodes operate on principles involving negative-resistance effects in bulk semiconductors. Unlike the conventional negative-resistance device, bulk semiconductors are simply pieces of highly purified n-type material - no p-n junctions enter into the structure at all. It is the quantum structure of bulk materials such as gallium arsenide that is responsible for junctionless negative-resistance effects. Fig. 1. (A) A simple bulk diode circuit that may be used as a Gunn oscillator. (B) Energy diagram of "n"-type semiconductor is similar to that of gallium arsenide. The negative-resistance curve (C) is typical of all bulk semiconductors. Fig. 1B illustrates the electron structure of n-type GaAs. 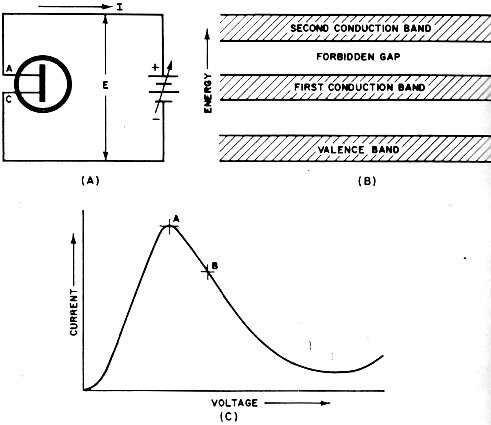 Note that there are two conduction bands separated by a forbidden gap. When an external d.c. source is below a certain threshold value, determined partly by the width of the forbidden gap, all electrons flow through the low-energy conduction band. Increasing the applied voltage slightly beyond the threshold potential gives a few electrons enough extra energy to jump the forbidden gap and flow through the high-energy conduction band. Any further increase in applied voltage simply increases the percentage of electrons using the high-energy band. In semiconductors such as the GaAs diode, the electrons behave differently in the two conduction bands. The band that carries the most current tends to dominate the over-all behavior of the device. Electrons in the low-energy band flow through the diode in a smooth stream much like any ordinary semiconductor. Electrons in the high-energy band, however, collect into a small packet or space-charge near the cathode, and travel in a group through the high-energy band toward the anode. When this space-charge disappears into the anode, all current flows through the low-energy band until another space-charge begins to form at the cathode. One other difference between the two conduction bands concerns the drift velocity of the carrier electrons. The free electrons in the low-energy band travel through the material with a much higher average velocity than does the space-charge in the high-energy band. Thus, when electrons are using the low-energy band, the average current through the device is higher. 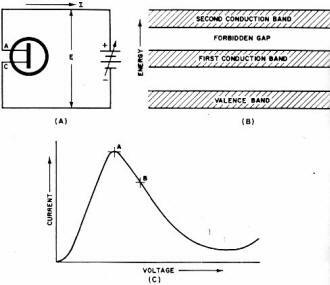 The fact that the current flow through the bulk GaAs diode grows smaller when the applied voltage is increased '1 above a certain threshold value shows that the device would have the nega­i tive-resistance characteristic curve as illustrated in Fig. lC. A forward d.c. potential large enough to drive the bulk diode deep into its negative-resistance region will force most electrons to use the slow-moving, high-energy conduction band as long as a space-charge is present to carry them via that route. However, as soon as the space-charge disappears into the anode, electrons have no choice. but to rush through the high-velocity band until the next space-charge begins to form. Without the benefit of external tuned circuitry, the bulk semiconductor diode will oscillate in the Gunn mode at a frequency determined by the transit time of the space-charge. To increase the operating frequency, the device must be shortened in the direction of current flow, and this operation decreases the device's ability to dissipate heat. An external LC circuit with a time-constant shorter than the transit time of the diode's space-charge may be connected into a Gunn-type circuit, as shown in Fig. 2. Fig. 2 - An LSA diode in the negative-resistance region delivers energy back into the diode, quenching the space charge. Operating frequency is the resonant frequency of the LC circuit. If the diode is properly doped for LSA operation, each birth of a high-energy band space-charge will be followed by a reverse-biasing half-cycle from the tuned circuit. This reverse-biasing energy will quench a newly formed space-charge, and reset the diode to its high conductance state until another space-charge can form. During the high-conduction state of the diode, the tuned circuit has a chance to move through its positive half-cycle and restore energy lost during the negative swing. By limiting the space-charge accumulation to a small fraction of its mature value, and by letting the tuned circuit determine the operating frequency, the bulk diode circuit can operate effectively at frequencies exceeding 50 GHz with power outputs near 100 m W.
Dr. Copeland developed the LSA diode as a result of a careful computer analysis of the Gunn effect. He found that a diode can operate in the LSA mode only if the product of the electron density, N, times the length of the device, L, is nearly equal to a very critical value of 1012 donors per square centimeter. A bulk diode having an NL product less than 1012 will not oscillate at all because the negative-resistance effect is spread over too much of the high-energy conduction band. On the other hand, a diode with an NL product greater than 1012 will operate only in the Gunn mode because the LC circuit will not have enough energy to reverse-bias and quench such strong space-charges. An analysis and comparison of frequencies and power limits for Gunn oscillators, LSA circuits, tunnel-diode oscillators, and small klystron circuits cannot be truly meaningful at this time. Microwave technology is in such a state of flux that any figures published today may be obsolete tomorrow. Many observers believe solid-state microwave devices, such as the Gunn oscillator and LSA diode, are pushing the communications industry toward the brink of a sweeping solid-state revolution. To be sure, these devices will find a place in the industry, but only where their advantages will pay off - not in vast, safe, well-manned, air-conditioned, megawatt communications complexes; but in tiny, remote radio stations and in the incredibly demanding environments of space.